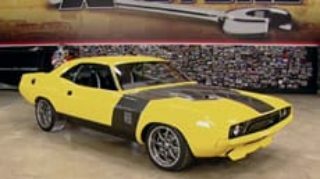 We help a veteran and St. Louis area firefighter finish what he started: A 1974 Dodge Challenger, by transforming it into a modern pro touring machine. The Cardona family and friends head to the Tech Center to see and drive Ty's classic Mopar Muscle in what can best be described as a modern pro-touring machine. Tim Strange uses his skills as a world-class custom painter to create a unique skin on Ty Cardona's classic '74 Dodge Challenger. 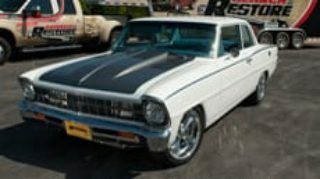 The original engine was a weak 318ci small block. But HorsPower's Mike and John build a powerful 392 hemi - then dyno the beast with unbelievable results! The Moore family heads to the Tech Center for the unveiling of Tom's classic ride. See how Tim Strange and his team of volunteers came through for this Michigan family. 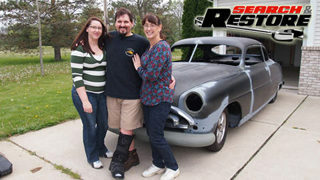 Tom & Lisa Moore join us from their living room to see all the metal Tim and the team cut out of the roof of his '51 Hudson Hornet. Can you say chop? 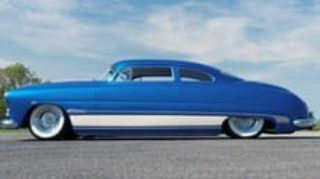 Unique, ahead of its time, built like a tank - all phrases indicative of the 50's era Hudson automobile. 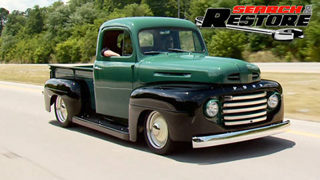 Tim Strange and the team call on the aftermarket to make it even better. Tom Moore's Hudson Hornet was in the process of being restored, when the project stalled for family priorities. Tim and the team rescue a classic. 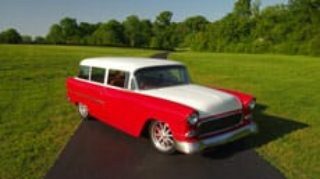 Shane's family, including aunts uncles and cousins arrive to see their 4-generation Ford for the first time after the final week of the build. 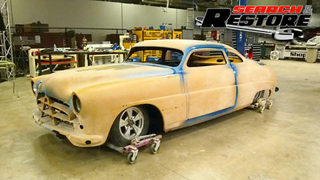 Tim and the team head to week 3 with paint and buff a priority as the '48 Ford keeps its traditional look with modern components. Interior trim, exterior trim, panels hardware, seals etc. (ANNOUNCER)>> THEY ARE FIRST RESPONDERS, MEN AND WOMEN WHO RISK EVERYTHING TO HELP OTHERS. TODAY ON SEARCH AND RESTORE WE TURN THE TABLES ON THIS FIREFIGHTER BY COMING TO HIS RESCUE. TIM AND OUR VOLUNTEERS TRANSFORM HIS CHALLENGER INTO A SHOW STOPPING PRO TOURER. THEN SURPRISE THIS HUMBLE HERO WITH THE ULTIMATE THANK YOU! ( )>> OH MY GOD! (TIM)>> I KINDA HAD AN IDEA OF WHAT I WANTED THIS CAR TO LOOK LIKE. SO I WAS THINKING ABOUT THIS WHEN I WAS DRIVING BACK FROM SAINT LOUIS ON THIS THING. I WAS LIKE, MAN I KINDA WANT TO GIVE HIM A MODERN STREET MACHINE, KIND OF A PRO TOUR THING. SO THAT'S THE GUYS THAT I CALLED. THANK ALL YOU GUYS FOR COMING. YOU'RE HERE, SO NOW YOU CAN'T LEAVE, YOU HAVE TO STAY AND HELP BUILD THE CAR. ( )>> COFFEE BREAK, ALRIGHTY. 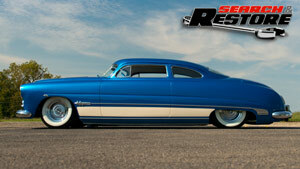 (TIM)>> EVERYBODY THAT COMES IN ARE TRUE HOT ROD BUILDERS THAT I DID A LOT OF RESEARCH ON. THEY HAVE A VISION, AND THAT'S JUST GOING TO GEL AND MAKE THINGS GO THAT MUCH SMOOTHER. ( )>> IT ACTUALLY FEELS PRETTY SOLID. IT'S NOT RUSTED ON THE INSIDE OF THE FENDER WELL. (TIM)>> I'M SURE THERE'LL BE SOMETHING THAT WILL FIGHT US LATER AND WE'LL SEE THAT WE WEREN'T EXPECTING IT CAUSE THAT'S JUST THE NATURE OF IT ALL. ( )>> IT'S A TEXAS CAR. ( )>> SOLID TEXAS CAR! ( )>> LOOK AT THAT! NO RUST, IT NEVER SNOWS IN TEXAS. ( )>> THE CAR'S IN A LOT BETTER SHAPE THAN WHAT I THOUGHT IT WAS GOING TO BE. ( )>> I THINK WE CAN TAKE CARE OF IT. (TIM)>> ALL THE WAY TO THE OTHER END OF THE BUILDING. ( )>> HOPE THEY'RE READY FOR SOME 18 TO 20 HOUR DAYS. (TIM)>> IT'S NOT A UNION SHOP, SO THERE'S NO SCHEDULED BREAKS. YOU JUST KEEP WORKING, PUSH THROUGH. (ANNOUNCER)>> FOR BUILD NUMBER EIGHT OUR FIRST MOPAR IS PUSHED INTO THE SHOP IN THE FORM OF THIS '74 DODGE CHALLENGER. OVER 40 YEARS AGO THE CHALLENGER WAS CHRYSLER'S ANSWER TO THE MUSTANG AND CAMARO. BASED ON THE POPULAR EBODY BARRACUDA, BUT A LITTLE MORE ROOMY. THEY WERE LATE TO THE MUSCLE CAR PARTY, WHICH FOR A CHALLENGER ONLY LASTED FIVE YEARS. SALES TUMBLED AFTER THE INITIAL OFFERING OF THE '70 TRANS AM MODEL. ENGINES GOT SMALL THANKS TO EMISSION REQUIREMENTS AND THE ARAB OIL EMBARGO, WHICH BOTH CONTRIBUTED TO THE END OF THE MUSCLE CAR ERA. BUT FOR COLLECTORS THESE MOPARS ARE STILL IN DEMAND, ESPECIALLY '70 AND '71 MODEL CHALLENGER AND CUDAS. THEY ARE RARE AND PRICEY. AND ALTHOUGH STILL HARD TO FIND, THE '74 REMAINS MORE AFFORDABLE. OUR CAR'S OWNER IS 46 YEAR OLD TY CARDONA, A FIREFIGHTER FROM HILLSBORO, MISSOURI. (TY)>> ALRIGHT, HERE'S MY GARAGE, THIS IS WHERE I'VE GOT MY CHALLENGER HIDING. LETS GO IN AND SEE IT. IT'S REALLY IN PRETTY GOOD SHAPE. I THINK IT DOES NEED NEW QUARTER PATCH PANELS. I DO HAVE THOSE PURCHASED ALREADY. HERE'S THE ENGINE COMPARTMENT. HERE'S THE INSIDE. NEEDS ALL NEW INTERIOR. (ANNOUNCER)>> TY IS A LIFE LONG GEARHEAD WHO CAUGHT THE MUSCLE CAR BUG EARLY ON. (TY)>> IN HIGH SCHOOL I HAD A '73 BARRACUDA THAT I BOUGHT FOR $500 DOLLARS. IT WAS BEAT UP, I MEAN IT WAS BAD. MY DAD SAID, WE'LL MAKE IT LOOK ALRIGHT. AND I WAS PROUD OF THAT CAR. I TOOK CARE OF IT AND HAD TO SELL IT WHEN WE GOT MARRIED CAUSE WE NEEDED A REAL FAMILY CAR. IT WAS A SACRIFICE I NEEDED TO MAKE, AND I NEEDED TO DO IT, AND DID IT. (TAMMY)>> I WAS PREGNANT WITH TRISHA AND WE GOT MARRIED. WE KEPT IT FOR A WHILE, AND THEN AFTER I CAME HOME WITH THE BABY HE WAS LIKE, THERE'S NO WAY. THE DAY THAT CAR LEFT HE STOOD IN THE DRIVE WAY AND CRIED. AND I THOUGHT HE'S NEVER GONNA GET THAT CAR BACK. (ANNOUNCER)>> THAT WAS 27 YEARS AGO WHEN TWO TEENS IN LOVE HAD TO GROW UP FAST, AND THEY DID RAISING THREE GREAT KIDS, AND NOW ARE GRANDPARENTS. TAMMY'S A MIDDLE SCHOOL PRINCIPAL, TY A PUBLIC SERVANT WITH STINTS IN THE US COAST GUARD, POLICE DEPARTMENT, AND NOW AS A VETERAN FIREFIGHTER. (TY)>> YOU SACRIFICE FOR YOUR FAMILY. FAMILY IS IT. YOU DO WHAT YOU HAVE TO DO TO MAKE THINGS BETTER FOR YOUR FAMILY. (ANNOUNCER)>> WHICH BRINGS US TO THE MOPAR TY BOUGHT 10 YEARS AGO AS A FATHER/SON PROJECT, BUT THE BOYS LOST INTEREST. (TY)>> I DECIDED WELL WE'LL JUST PARK IT IN THE GARAGE AND MAYBE I'LL GET TO IT ONE OF THESE DAYS. BETWEEN KEEPING ALL THEIR TRUCKS AND CARS RUNNING, I'VE NEVER REALLY HAD THE TIME TO GET MY OWN STUFF FIXED. (TAMMY)>> BEING ABLE TO SEE HIM HAVE SOMETHING THAT WE KNOW THAT HE GAVE UP FOR US, IT'S MORE THAN WORDS CAN SAY. (TIM)>> WEEK ONE IS METAL MOCK UPS. SO WE'LL START PULLING EVERYTHING OFF. HAMMERS, PLIERS, WRENCHES, RATCHETS, SCREW DRIVERS, WRENCHES. 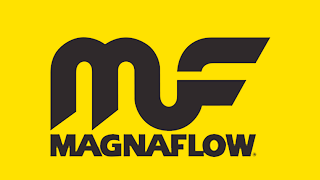 (TIM)>> WE'VE GOT MIKE AND JOHN FROM THE HORSEPOWER SHOW, AND THEY'RE GONNA DO WHAT THEY DO BEST, BUILD US SERIOUS, RELIABLE HORSEPOWER. OKAY, THAT'S ENOUGH, THAT'S ENOUGH, THAT'S ENOUGH, THAT'S INAPPROPRIATE. A GOOD THING WHEN YOU'VE GOT A RUSTY OLD CAR, YOU GOT SOME WD 40 TO CRACK ALL THE HARDWARE LOOSE. IT'S CALLED BLUE TORCH TECHNOLOGY. YOU PUT IT ON ALL THESE BOLTS THAT'S BEEN ON HERE FOREVER AND YOU JUST KINDA SQUIRT IT, AND IT'LL SEEP IN BEHIND THE BOLTS AND LOOSEN EVERYTHING AND THE BOLT JUST SPINS RIGHT OFF. (JOHN)>> LOOK AT THAT! WHO SAID I'D NEVER AMOUNT TO ANYTHING. (TIM)>> BY WEDNESDAY WE NEED TO HAVE PRETTY MUCH A ROLLING CAR, ALL GROUND, ALL BARE METAL, ALL MOCKED, ALL METAL WORK DONE THIS WEEK. (ANNOUNCER)>> A TALL ORDER INDEED! NEXT, MORE TEAR DOWN PLUS SERIOUS SKILLS BEGAT CUSTOM TOUCHES. 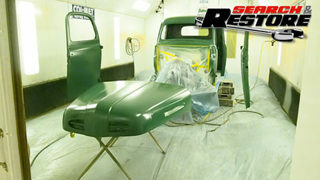 (TIM)>> WEEK ONE IS ALWAYS ANYTHING CUSTOM METAL AND RUST REPAIR. SO WE'RE ADDRESSING THE RUST REPAIR RIGHT NOW. GOT IT UP IN THE AIR, STARTED WELDING UP BUMPER BOLTS, HOLES RIGHT NOW. AND WE'VE GOT SOME GRINDING, READY TO PUT SOME PATCHES ON, GETTING READY TO PULL THE MOTOR AND TRANSMISSION OUT, A LITTLE BIT OF EVERYTHING GOING ON. (EDDIE)>> YOU CAN SEE WHERE IT'S TOUCHING HERE AND IT'S TOUCHING HERE, BUT IT'S BOWED OUT. WE'RE GONNA TAKE THIS OVER TO THE SHRINKER AND WE'RE GONNA SHRINK THAT PIECE OF METAL FROM HERE TO HERE. SO IT'LL TIGHTEN THAT CURVE A LITTLE BIT AND FIT RIGHT INTO THE ORIGINAL PANEL HOLDS. AND IT ACTUALLY HAS FINDERS AND IT'LL FIT THE FINGERS, IT'LL SQUEEZE THE METAL TOGETHER. SO IT'S ESSENTIALLY JUST WADING THE METAL UP. I DON'T WANT TO DO TOO MUCH BECAUSE YOU CAN'T TAKE THIS BACK OUT. WE'LL DO A LITTLE BIT AT A TIME UNTIL WE GET IT TO FIT THAT PANEL JUST RIGHT. (ANNOUNCER)>> EDDIE'S SHOP SPECIALIZES IN HIGH CLASS INTERIORS, AND HE'S GREAT WITH METAL TOO, BUT THE WILDFIRES IN COLORADO LAST SUMMER NEARLY TOOK IT ALL. (EDDIE)>> IT CAME VERY CLOSE TO MY HOME. 30 MILES FROM MY HOME, SO HELPING OUT A FIREMAN WAS KINDA SPECIAL, ESPECIALLY THIS YEAR. I FEEL BLESSED BECAUSE I'M ABLE TO DO SOMETHING THAT I LOVE TO DO EVERY SINGLE DAY. THERE'S A LOT OF PEOPLE WHO DON'T GET TO DO THAT. AND I HATE TO USE THE TERM GIVING BACK BUT I OWE IT. (TIM)>> NOT SURE IF HE SHOULD BE RUNNING A CUTTING TORCH. I'M A LITTLE SCARED. ( )>> HEY WE'RE GONNA LOWER THE CAR! (MIKE)>> I'M WAITING ON A FORK LIFT DRIVER, THEN WE'LL HAVE THIS ENGINE OUT. WITH EVERYTHING DISCONNECTED, WE'RE GONNA USE THE FORK TRUCK TO LOWER THE ENGINE CRADLE WITH THE TRANSMISSION AND ALL THE ACCESSORIES. NOW ALL THE CONNECTIONS ARE DONE, TAKEN LOOSE. ALL WE'VE GOT TO DO NOW IS DRIVE THE FORKS UNDERNEATH IT. ( )>> COME ON UP, OKAY, YOU'RE ON THE KFRAME NOW. (MIKE)>> RELEASE SOME WEIGHT OFF THE WHOLE ASSEMBLY, UNDO FOUR BOLTS. ( )>> THERE WE GO, THAT DID IT RIGHT THERE. (MIKE)>> AND EVERYTHING WILL COME OUT OF THE BOTTOM. 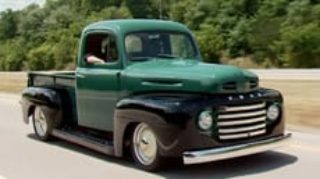 NOW BACK IN THE DAY THIS WAS CONSIDERED A MUSCLE CAR, BUT AS FAR AS THE POWER RATING, IT HAD A PRETTY WEAK 318 AND A LITTLE THIMBLE UP TOP FOR A CARBURETOR THANKS TO OPEC. NOW THIS IS THE START OF THE NEW ENGINE. WE'RE USING THE BLOCK AND THE TRANSMISSION FOR MOCK UP RIGHT NOW. WHAT IT IS IS IT'S A LATE MODEL HEMI FIVE POINT SEVEN TRUCK ENGINE. 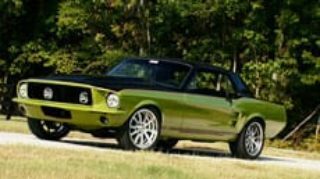 NOW WE GOT THE PARTS ORDERED, WE EXPECT TO SEE WELL OVER 525 HORSEPOWER AND 450 FOOT POUNDS OF TORQUE, MAKING IT WHAT A MUSCLE CAR SHOULD HAVE BEEN. (TIM)>> ANOTHER COOL THING THAT WD 40 HAS IS THIS RUST REMOVER SOAK. WHAT I'M GONNA DO IS TAKE SOME OF THESE RUSTY BOLTS. THESE ARE ACTUALLY THE BAG THAT WE TOOK OUT BUMPER BOLTS. REALLY RUSTY AND CRUSTY FROM BEING UP UNDERNEATH THE CAR FOR ALL THOSE YEARS. I'M GONNA TAKE SOME OF THIS RUST REMOVER SOAK AND SOAK IT FOR ABOUT 24 HOURS. THESE BOLTS ARE SO RUSTY, YOU COULD SOAK FROM 30 MINUTES, TO OVERNIGHT, TO 24 HOURS. THESE ARE REALLY RUSTY. SO I'M JUST GONNA LET THEM SOAK. I'LL COME BACK TO THEM IN A COUPLE OF DAYS. YOU CAN SEE THE RUST COMING OFF OF IT ALREADY. AND THROUGH THE MAGIC OF TV, A COUPLE OF DAYS LATER, LOOK AT THAT, NICE AND CLEAN. I THINK I KNOW THIS SEASON THIS IS THE BEST CONDITIONED CAR THAT WE'VE ACTUALLY STARTED ON. I HATE TO SAY THAT BECAUSE SOMETHING ALWAYS SHOWS UP. EITHER SOMETHING GETS HIT, BENT. BUT WE'VE KINDA GOT THE WEIRD AREAS GROUND DOWN AND WE'RE ADDRESSING IT. SO I THINK WE'RE GONNA BE PRETTY GOOD. (ANNOUNCER)>> COMING UP, WE'LL SHOW YOU THE SECRET MISSION TIM AND OUR CREW WENT ON TO SURPRISE OUR FIREFIGHTER, STAY TUNED! (TIM)>> WE'RE HERE TO GET YOUR CAR TODAY. (TY)>> MAN, YOU CAN HAVE IT, I'VE SEEN WHAT YOU DO. (ANNOUNCER)>> ONE OF THE AMAZING THINGS ABOUT THESE BUILDS IS DISCOVERING WHO THE TRUE BENEFICIARIES ARE. (BOB)>> I'M REALLY HAPPY THAT I DON'T HAVE TO DO THIS FOR A LIVING BECAUSE I'M JUST NOT THAT GOOD AT IT. I WORK WITH COMPUTERS MOST OF THE TIME. AND SO, THE OPPORTUNITY TO COME HERE AND REALLY DO WHAT'S MY HOBBY, WORK WITH MY HANDS, WORK WITH A BUNCH OF GREAT PEOPLE. WHAT A GREAT OPPORTUNITY THAT IS. IT'S A LOT OF FUN, IT'S REALLY SATISFYING. (ANNOUNCER)>> SATISFYING BECAUSE THE VOLUNTEERS KNOW WHO THEY'RE WORKING FOR, POWERBLOCK VIEWER TY CARDONA. A 16 YEAR VETERAN OF THE MEHLEVILLE FIRE DEPARTMENT IN SOUTH SAINT LOUIS COUNTY. TY WAS CHOSEN OUT OF TENS OF THOUSANDS OF APPLICANTS, BUT TO SURPRISE THIS GUY OUR CREW HAD TO GET A LITTLE CREATIVE. WHILE TIM MADE THE 350 MILE TRIP ACROSS THE OHIO RIVER ON THE WAY TO MISSOURI, WE SENT IN CAMERA GUY ROB AHEAD OF TIME ON A SECRET MISSION. (TY)>> CARABINEERS THAT WE'VE BEEN USING. WE'RE USING A DRING, DSHAPE CARABINEERS. (TIM D.)>> TY'S IN CHARGE OF OUR HIGH ANGLE RESCUE ROPE TEAM. (ANNOUNCER)>> DEPUTY CHIEF TIM DEMPSEY WAS OUR INSIDER. (TIM D.)>> SO THE PLAN WAS TO HAVE HIM PUT TOGETHER A TRAINING VIDEO ON ROPES AND ON A RIGGING SYSTEM FOR HIGH ANGLE RESCUES AND THAT KIND OF STUFF. SO AS SOON AS YOU TELL HIM THAT, HE WAS SERIOUS ABOUT PUTTING TOGETHER A SERIOUS CLASS. I DON'T EVEN THINK HE HAD TIME TO THINK ABOUT ANYTHING ELSE BUT THIS CLASS. (ROB)>> FIX YOUR MIKE. SO I SPENT ALL DAY WITH HIM DOING TRAINING VIDEOS, TO THE CLASSROOM. WE ACTUALLY DID ROPE REPELLING IN A TOWER AT THE OTHER STATION. HE THINKS THIS IS REALLY LEGIT UNTIL THE AFTERNOON, THEN WE SURPRISE HIM. SO I NEEDED TY OUT FRONT AT ABOUT TWO O'CLOCK CAUSE THAT'S WHEN WE'RE GONNA BRING THE SEARCH AND RESTORE TRUCK DOWN. I NEEDED EVERYBODY IN THE FIRE STATION OUT FRONT. LITTLE DID HE KNOW, IT WAS ALL SET UP FOR WHEN TIM COMES DOWN THE STREET. (TY)>> HOLY COW! I THINK THEY'RE TAKING MY CAR. (TIM)>> I THINK WE'RE LOOKING FOR YOU AREN'T WE, TY? (TY)>> YEAH YOU SURE ARE, HOLY COW! (TIM)>> WE'RE HERE TO GET YOUR CAR TODAY BUDDY. (TY)>> MAN, YOU CAN HAVE IT. THAT'S COOL! (TIM)>> SO I DON'T KNOW IF NOW'S A GOOD TIME TO TELL YOU THAT ALL THIS TODAY, THESE ARE OUR CAMERA GUYS THAT'S BEEN HERE WITH YOU. SO ALL THESE GUYS MIGHT WANT TO BE MAD AT YOU RIGHT NOW. (TY)>> I'LL BUY PIZZA, I'M SORRY. I DON'T KNOW WHAT TO SAY, I APPRECIATE IT. THIS IS, THEY'RE GONNA DO MY CHALLENGER. ( )>> SO YOU WENT TO HIM TO GET IT DONE. (TY)>> I NEVER WIN ANYTHING. (TIM D.)>> WE HELD THE SECRET. IT WAS GETTING TOUGH THERE AT THE END, BUT TY DESERVES IT. WHEN HIS FAMILY FINDS OUT ABOUT IT, HIS BOYS, THEY'RE GONNA BE ECSTATIC. (TIM)>> HE WAS ALMOST STARTING TO WELL UP A LITTLE BIT, BUT HE'S LIKE I CAN'T CRY IN FRONT OF THE GUYS. ( )>> HE'S DONE THAT BEFORE. (TY)>> THIS IS MY WIFE TAMMY. (TY)>> THIS IS MY SON TYLER, MY DAUGHTER TRISHA. THIS IS MY SON TRAVIS, WE CALL HIM TRAV. (TIM)>> WELL I'VE WAITED LONG ENOUGH, I WANT TO SEE THIS CAR, LETS GO. (TY)>> WHAT DO YOU THINK TIM? (TIM)>> IT'S REALLY NOT THAT BAD IS IT? (TY)>> NAH, IT'S NOT TOO BAD. (TIM)>> OKAY, SO WHAT WAS YOUR PLANS FOR THE CAR? (TY)>> I HAD THAT '73 BARRACUDA. I KINDA GO WITH A YELLOW THEME. I WAS GONNA PUT A LITTLE 360 IN IT WITH SOME TYPE OF FUEL INJECTION ON IT TO MAKE IT EASIER TO DRIVE. I WANT SOMETHING I CAN DRIVE A LOT, HANDLE GOOD, MAYBE SOME AIR CONDITIONING. (TIM)>> YOU KNOW WE'RE PRETTY MUCH ALLOWED TO DO WHATEVER WE WANT WHEN WE TAKE IT? (TY)>> OH YEAH, DO WHAT YOU WANT, FIX IT. (TIM)>> OKAY, LETS LOAD THIS UP, GET BACK TO THE TECH CENTER. (TY)>> IF YOU'RE THINKING ABOUT TRYING OUT FOR THIS, DO IT. YOU KNOW I DON'T DESERVE ANY BLESSINGS GOD GIVES ME, BUT I'M APPRECIATIVE OF THEM. (TAMMY)>> IT'S GOING TO BE HIS BABY, NOT TO MENTION THE TIME THAT HIM AND HIS BOYS CAN ENJOY THAT CAR TOGETHER. (TY)>> I CAN'T FATHOM WHY YOU THINK I DESERVE IT BUT I SURE AM HAPPY THAT YOU DO. (ANNOUNCER)>> CALL THEM MAGICIANS, WIZARDS, WHATEVER, WHAT THESE VOLUNTEERS CAN DO WITH METAL IS SIMPLY AMAZING, STAY TUNED! (TIM)>> THE CREW WE HAVE THIS WEEK SO FAR IS GELLING REALLY GOOD. WE HAVE ONE LUXURY THAT FOUR GUYS CAME FROM ONE SHOP. SO THOSE GUYS WORK TOGETHER EVERYDAY. (BRIAN)>> WE'VE GOT GREAT GUYS, THEY'RE ALL DEDICATED. I MEAN A LOT OF MY GUYS ACTUALLY SLEPT AT THE SHOP, PULLED ALL NIGHTERS. JARED'S 25, MATT'S RELATIVELY NEW TO OUR CREW AND HE AMAZES US EVERY DAY WITH HIS TALENT. PAUL'S GREAT, HE'S MY RIGHT HAND MAN. (PAUL)>> IT'S REALLY A GREAT GROUP OF GUYS AND WE'RE ALL DOING OUR DAMNDEST TO GET THIS THING PUT TOGETHER FOR THIS GUY IN THE WEEK THAT WE HAVE. (BRIAN)>> THIS IS EXACTLY WHAT WE DO. WE TAKE THE OLDER MUSCLE CARS, MODERNIZE THEM, AND JUST MAKE THEM FUN TO DRIVE. WE'RE BUILDING A REAR SPOILER IN THE DECK LID. IT'S GOT A LITTLE SWOOP DOWN IN THE CENTER. JUST GIVE IT A REAL MODERN LOOK. I MEAN IT'S SOMETHING THAT THE TEAM AND I COME UP WITH AS WE'RE GOING ALONG, AS WE'RE BUILDING IT. (RICKY)>> WHEN I SAW IT I WAS LIKE, WOW MAN, THEY PUT A LOT OF WORK AND A LOT OF THOUGHT INTO THAT. THAT'S IMPRESSIVE MAN! THOSE GUYS WORK GOOD TOGETHER. (ANNOUNCER)>> RICKY HAD A HAND IN THIS TOO. HE ALREADY REPLACED THE FACTORY TRIM WITH PERMANENT STEEL ADDITIONS. (RICKY)>> I HAD IT IN MY MIND BEFORE I EVEN STARTED HOW IT WAS GOING TO TURN OUT. IT'S BASICALLY LIKE BUILDING A PUZZLE FROM SCRATCH. WHEN I FINISHED THAT UP THEY TOOK IT TO ANOTHER LEVEL. (JOHN)>> WE CAN MAKE IT LOOK PRETTY ALL WE WANT TO, BUT EVENTUALLY WE'VE GOT TO MAKE IT GO. 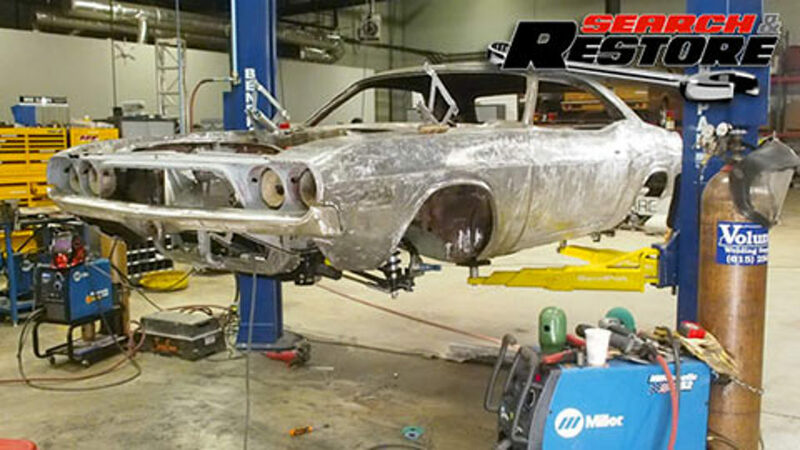 (TIM)>> NOW BEFORE WE DO ANY MOCK UP OR DROP THE ENGINE AND TRANSMISSION IN WE HAVE TO INSTALL THE REILLY MOTORSPORTS FRONT CRADLE. NOW THIS THING IS DESIGNED TO FIT THE LATE MODEL HEMI INTO THESE CARS, AND IT'S VERY, VERY STURDY. I ALSO GOT A WHOLE BUNCH OF STUFF FROM RMS. THEY CALL IT AN ALTERCATION SUSPENSION KIT FOR THE OLD MOPARS. A BOLT IN FRONT AND REAR SUSPENSION AND COILOVERS FROM STRANGE ENGINEERING. THAT WAS EMPTY. (JOHN)>> HEY, DOES THING GOT A HEMI IN IT? (MIKE)>> ALRIGHT GUYS, COMING DOWN SLOW, SLOW. WATCH YOUR HAND TIM PLEASE. NOW THIS ENGINE BAY WASN'T BUILT FOR A HEMI, AND WE KNEW WE WOULD HAVE SOME ROOM CONSTRAINTS WITH THE NEW SETUP. NOW THE TRANSMISSION WE'RE USING IS A TREMEC SIX SPEED FROM AMERICAN POWERTRAIN. 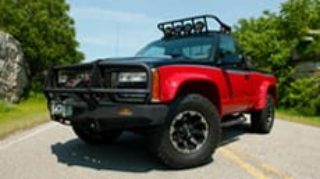 IT'S FITTING WITH ALL THE COMPONENTS THEY MAKE AS WELL AS A HYDRAULIC CLUTCH PEDAL, CLUTCH AND SHIFTER. (MATT)>> A LOT OF PEOPLE GO TO JUNKYARDS AND GET SIX SPEED TRANSMISSIONS OUT AND REALIZE THEY DON'T HAVE THE RIGHT SHIFTER, THEY DON'T HAVE THE RIGHT MOUNT, ELECTRONICS TO RUN IT. (GRAY)>> OUR SYSTEM IS SO COMPLETE IT COMES WITH EVERYTHING RIGHT DOWN TO THE RUBBER PEDAL PADS TO DO A COMPLETE INSTALLATION WITHOUT RUNNING TO THE PARTS STORE. (MATT)>> WE TAKE ALL THAT GUESS WORK OUT AND MAKE IT REALLY EASY. (JOHN)>> HANG ON, WE'RE ON THE RACK. I CAN'T GO ANYWHERE ELSE. I'M HITTING THE SHIFTER ON THE TRANS TUNNEL. (TIM)>> IT'S OKAY, WE'VE GOT A FIREMAN HERE, RICKY'S ON IT. RICKY STARTED THE FIRE. A FIREMAN STARTED A FIRE! ( )>> THIS SIDE'S GOOD TO GO HERE. (TIM)>> YEAH, THAT MOTOR FILLS THAT ENGINE COMPARTMENT UP DON'T IT? (TIM)>> SO NOW THAT WE'VE GOT THE NEW MOTOR AND TRANSMISSION MOCKED UP IN THERE, IT'S NOT BUILT YET. SO IT'S GONNA COME BACK OUT. WE CHOSE THIS TIME TO MAKE THE ENGINE COMPARTMENT LOOK A LITTLE BIT COOLER AND A WHOLE LOT OF CUSTOM. WE COME UP SOME IDEAS TO MAKE THESE LITTLE COVERS. JUST 18 GAUGE SHEET METAL COVERS THAT'LL SCREW IN AND WE'RE GONNA HIDE ALL THE COMPUTER ELECTRONICS FOR THE ENGINE AND THE FUEL INJECTION UNDERNEATH THOSE PANELS. I THINK I LIKE THAT. THE KEY WORD IS MOCK UP. YOU'VE GOT TO PUT EVERYTHING ON THE CAR THREE OR FOUR TIMES TO MAKE SURE IT'S RIGHT. YOU DON'T JUST BLOW IT APART AND PAINT AND THINK THIS NEW LATE MODEL FIVESEVEN HEMI IS ACTUALLY GONNA FIT IN THAT CAR WITHOUT A LITTLE BIT OF TRIMMING HERE AND THERE. ( )>> NAH, THAT'S PERFECT. (BRIAN)>> WE'VE GOT A GOOD CREW. IT'S NICE TO BE ABLE TO DO SOMETHING WHERE WE CAN SHINE. (MATT)>> THEY MADE A SPOILER OUT OF THIN AIR BASICALLY, JUST SCULPTED IT OUT OF METAL. I'VE BEEN WATCHING THAT WHOLE PROCESS, IT'S BLOWN MY MIND, IT'S CRAZY. (PAUL)>> NOW WHEN YOU ACTUALLY SEE A GUY THAT'S GIVEN UP PRETTY MUCH A CAR. I MEAN TO US CAR GUYS, GIVING UP A CAR IS YOUR LIFE. HE DID IT AND NOW IT'S TIME TO GET PAID BACK.